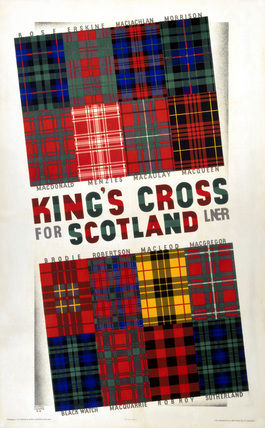 Poster produced for the London & North Eastern Railway (LNER) promoting rail travel from King's Cross station in London to Scotland, showing a selection of tartans. Tartan is a woollen fabric with a chequered pattern, traditionally worn by Scottish Highlanders, with each clan having a distinctive pattern. Here, 16 different tartans are pictured, with the names of the clan associated with each one, included. Artwork by Austin Cooper (1890-1964). Printed by the Dangerfield Printing Co Ltd, London.